You can now breathe the benefits of propolis through a mask and aerosol! The PROPOLtherapy diffuser has a multifunction touchpad, allowing you to personalize your experience. disactivate the ionizer allows use in the presence of children under 3 years of age. using the fan will allow you to saturate the environment up to 60 mq. Information is available in 5 languages - English, Italian, German, French and Spanish. 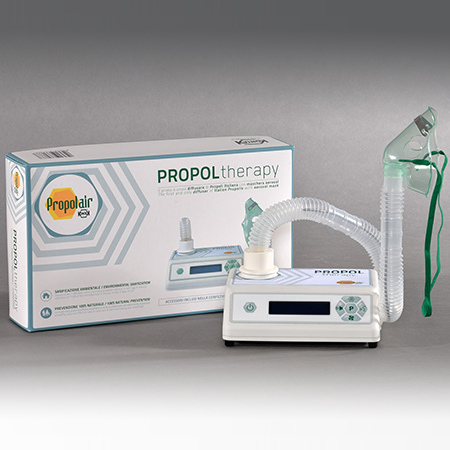 The PROPOLtherapy kit includes a mask (adults and childrens) and tube.